Branson Tractor was founded in the US in 1998 as a tractor distribution company. Kukje Machinery in South Korea is their parent company and has been in business since 1968. 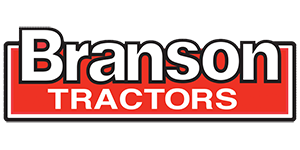 Branson Tractor now has 165 dealerships in the United States and Canada. Branson Tractors has three warehouses. The Rome, Georgia location not only has a warehouse, assembly and distribution center, it is also the Corporate Office. Another warehouse, assembly and distribution center is located in Plainview, Texas and North Plains, Oregon.